With a smile so bright you will never know her struggles. Motherless, fatherless…her life is a battle. Miss Pin Phoumipaseuth is 12 yrs. old whose mother died when she was 7 years old and was abandon by her father. Imagine not being wanted by your own father. How would you feel? Also imagine your older brother and sister not wanting to care for you; your own flesh and blood and they have turned their backs on you. The eldest brother is married with his own family and therefore not wanting to care for Miss Pin and his younger siblings. The eldest sister dropped out of school and never finished primary school. She married at a very young age and started a family of her own. They both are unable and unwillingly to help care for their younger siblings. Miss Pin’s uncle became her family and father figure. He is 59 years old and though it is not his responsibilities he is currently caring for Miss Pin as well as one of her older brother and younger sister. She is the fourth child out of 5 siblings. They live in a small broken down shag with no running water and no furnitures whatsoever; So that means they don’t have any couches, beds, tables, chairs, refrigerators, closets or television. They don’t have the simple household items that a home should have. Their house is built on wooden pillars and is made out of woven bamboo and sawn lumber for floors and walls; the roof is made from dried grass thatch and bamboo shingles. The house has no doors and there is no insulation as the bamboo walls are also falling apart. 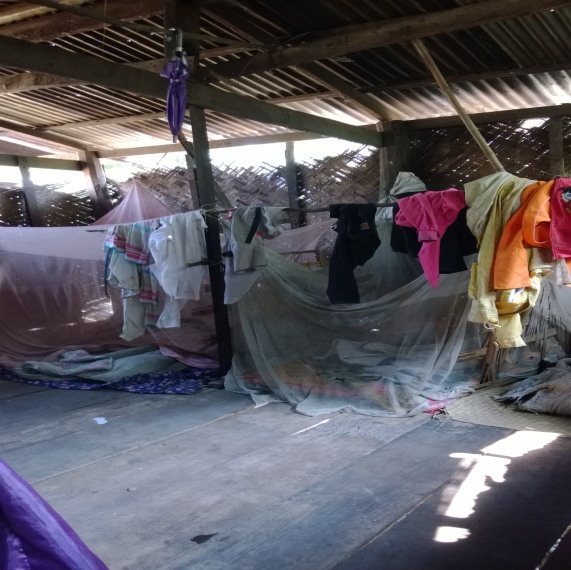 So when it is cold, it is freezing and they have to rely on blankets as there are no heaters and when it is hot, it is excruciating hot as they don’t have air conditioned. It is not suitable but they have learned to adjust and do what they can with the things they have. Inside the home is just one empty room. The one room is not only used for sleeping area but also for eating and gathering area. There are 5 people in the household and they are crammed together. For privacy, each sleeping area is divided by a mosquito net. They sleep on the hard wooden floors. You are wondering about the bathroom right? Well there is none. They go out into the woods. This is how poor they are. It is unsanitary and unhealthy. 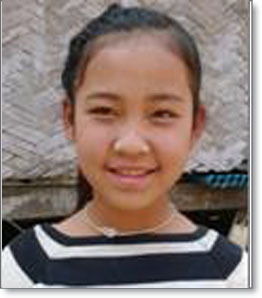 Her brother unable to complete further in his education helps the uncle with financial income. They are farmers and plant fruits and vegetables however income varies due to product, weather, and competition. Their average wage is approximately 300,000 kip per month which is 30 yen to feed 5 people and send 2 children, Miss Pin and her younger sister, to school. This is surely not enough. Miss Pin also helps her uncle and brother. At 12 yrs. old, she is not only going to school but doing hard labor. 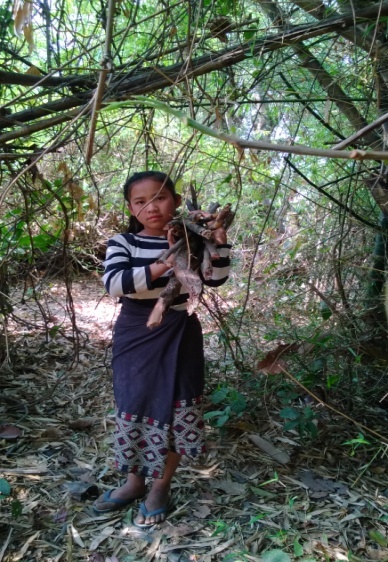 Her typical day includes: waking up before the sun comes out to cook and clean, go to school, after school going out to find wood for cooking all while caring for her younger sibling and making dinner. Behind her smile you will never know that Miss Pin lives a hard, tough life. She is very thankful for the scholarship opportunity as this is one step closer in achieving her dream in becoming a teacher. Her uncle is very supportive and wishes his niece’s donor happiness and success.